The beauty of the jatropha tree is not only its butterfly-attracting scarlet flowers - but also that it blooms an amazing 365 days a year. The dwarf jatropha tree (Jatropha integerrima 'Compacta') is the one to buy...it stays smaller and denser and is the one most commonly sold at nurseries. Versatile and showy, the clusters of tiny but vivid flowers stand out against deep green leaves and the small size makes it the perfect accent tree for sunny areas. 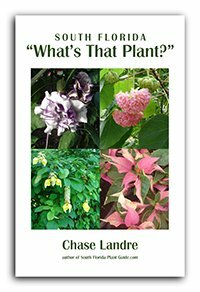 This red flowering tree is actually a jatropha shrub trained to a single trunk...or you can grow it as a bush, and, as it matures, keep the base cleaned up for a multi-trunk tree look. 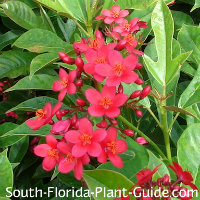 One of South Florida's most consistent butterfly attracting plants, jatropha is also a favorite with hummingbirds. This tree is a fast grower - the dwarf variety gets only 6 to 8 feet tall. It needs full to part sun and a well-drained spot. Jatrophas are drought-tolerant once established, preferring regular waterings with time to dry out in between. These plants can be cold-sensitive and do best in Zone 10. 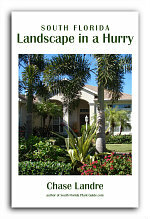 They're evergreen but may lose some leaves during cold weather. Never fear - leaves or not, a jatropha will still flower non-stop. Add composted cow manure to the hole when you plant. You can add top soil as well, especially if the soil in that area is very dry. You can trim for shape anytime. Prune heavily in spring (late March and early April) and it will fill out quickly to become lush and full. Keep the trunk free of baby shoots to maintain the tree look. Fertilize 3 times a year - once each in spring, summer and autumn - with good-quality granular fertilizer, preferably one high in phosphorus. Supplement with bone meal to promote heavier bloom. The "head" of this little tree will spread wide so come away from the house at least 3 to 4 feet. 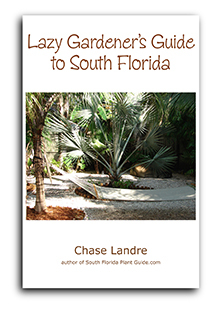 If you plant several in a row, place them 4 to 6 feet apart. You can plant as close as 3 feet from a fence. The tiny flowers won't make a mess so placement very close to a patio, walk or drive works fine. Jatropha trees will grow in large containers as long as they can dry out between drinks of water. Pair with other plants that like it on the dry side, such as juniper, crown of thorns, dwarf bougainvillea, lantana, bulbine, plumbago, Indian hawthorne and muhly grass. 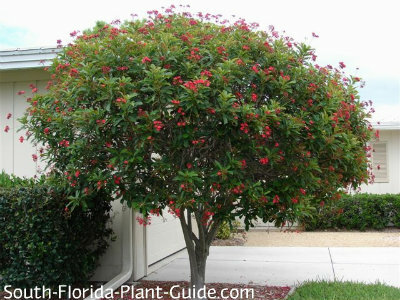 Other small flowering trees you might like: Red Cluster Bottlebrush Tree, Powderpuff Tree.